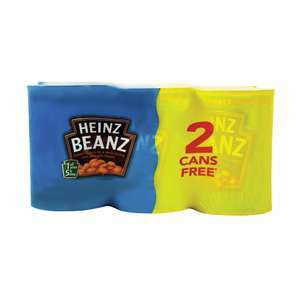 2 Extra Free Heinz Beans on a 4-pack - 6 X 415g. Unusually windy this weekend! They are no where as nice as Heinz beans imho. That wont soften the skins on them to the level of Heinz. Where do you buy your Heinz Beans? And at what price? Oh, you don't buy Heinz - Mr luvstomakeupwords. Where do you buy your Heinz Beans? And at what price? Oh, you …Where do you buy your Heinz Beans? And at what price? Oh, you don't buy Heinz - Mr luvstomakeupwords. "superior product"....... yeah more sugar(unhealthy) - double the fat content - less protein - no ringpull for easy opening - sounds like you've been taking lessons from Trump - new name for you "luvstoconcealtherealdeal"